Here you can find information about how to get immediate help via the easy remote access tool, email or Skype. Our support team can help you to install the application or to fix a problem. It is free, available in real-time, and you can watch our actions on the screen. You only need 1 minute to create remote access for support staff. This is very easy and secure (doesn't require you to manage permissions or to open ports, etc..) Also you can get help via instant messenger. Via Skype: Our id is "support@element-it.com"
Download great free for trial TeamViewer Quicksupport utility www.teamviewer.com/download (~3 MB). 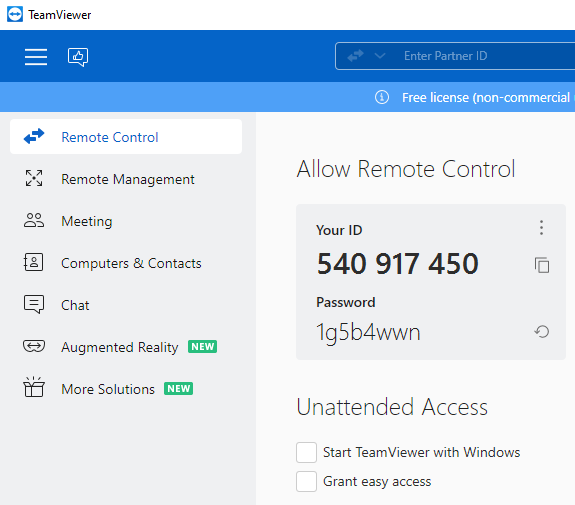 Run TeamViewer and in the first dialog select Usage: Run. Accept license agreement and then click Next. Use instant messengers to pass TeamViewer ID and password. Don't send it via email because there is no guaranty that your message will be processed immediately. It may take more than half a day before someone reads your letter. By that time you'll likely close TeamViewer and the credentials will be useless. Watch your display screen while our support staff helps you to install the application and set it up. You can use your mouse and your help will be needed to type passwords, etc..
Configure firewall (video screencast) Note! If you need to know our IP then use "95.86.206.147"